Manchester United. Oasis. Coronation Street. Everyone thinks they know Manchester but a real Manc will tell you that their Manchester is so much more than a northern stereotype. 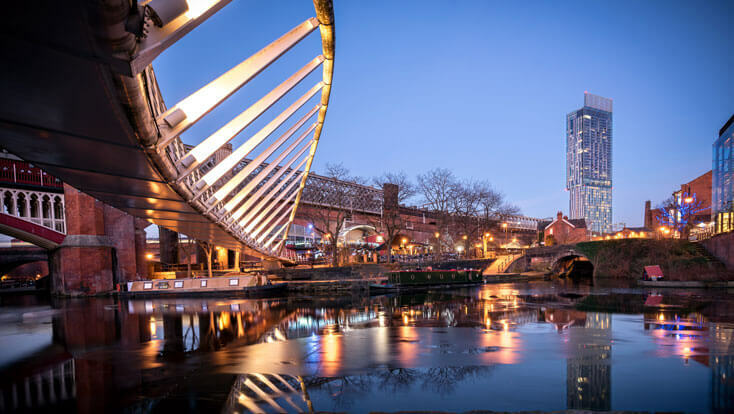 In the last 20 years, Manchester has evolved into a cosmopolitan cultural melting pot with the development of the bohemian Northern Quarter, environmentally conscious Green Quarter and sophisticated Spinningfields. Visitors to Manchester can expect a never-ending stream of attractions, art and live music to indulge in as the city blends traditional institutions, like the Science and Industry Museum or the Manchester Art Gallery, with more experimental scenes, including the Lowry, Home and the Castlefield Gallery. There’s also plenty of smaller venues to check out while you’re in the city, like Matt and Phred’s Jazz Club or the Comedy Store. Don’t forget to do a little shopping in between visiting each attraction, as Manchester has enough stores to satisfy even the wildest shopaholic. Take a trip out to the Trafford Centre and explore the grandeur of the faux-roman architecture as you browse dozens of stores or stay in the city and dive into the hustle and bustle of the Arndale centre – a perfect way to spend the day when the infamous Manchester showers start. No matter what you do, be sure to explore every nook and cranny of this incredible city and don’t be surprised if it steals your heart along the way.